Hi ladies, happy Monday to you all. I hope you enjoyed your weekend and are having a good morning. I can't believe how quickly the month of April went by! 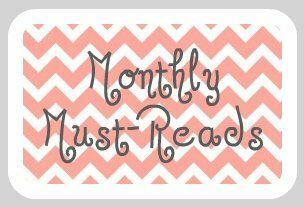 That means it's time for monthly must-reads. April's question is: What's your best beauty tip/secret (aside from: drinking lots of water, wearing sunscreen and taking off your make-up at night). For me, it's all about moisturizing, moisturizing, moisturizing! I think I look and feel my best when my skin is fresh and dewy. Although I use Makeup For Ever's HD Powder to set my makeup, I finish off with a good spray of Urban Decay's All Nighter or MAC Fix+. Not only does my makeup last longer throughout the day, but it also gives me a dose of hydration that leaves my face glowing. I don't like looking shiny, but I also hate looking dry. Taking good care of your skin and moisturizing every morning and evening is so important to me now that I'm in my late twenties. Beautygirl24 - Noelle has been discovering new beauty products. See what she recommends, and one product she thinks you should avoid. Ella Pretty - Ella's reviewing lip balms - find out which one tops her list. Lilly's Style - Lilly's keeping it simple. Pearls and Green Tea - Jiye shares her favorite make up essentials! Saltwater Dreams - See Andi's favorite inspirations for Spring. Schnelle Couture - Danielle has re-invented the traditional button-up: wearing it open and belted instantly transforms it from dressy to casual. Sequins and Stilettos - Skylette knows to add a bright color to punch up a "Casual Friday" look. I really agree with the importance of moisturization - I had to give up moisturizers for 3 months when I first started acne treatments - and I think it created forehead lines. When I went back to using moisturizer, the lines diminished, but I bet they wouldn't have formed in the first place if I had kept using moisturizer...the old wrinkle-acne trade-off LOL! It is a horrible trade off isn't it? Your skin looks great though, I've never noticed any lines at all! I agree! I had to stop using moisturizers before my laser treatments but I started using it again just because it seemed wrong not using any moisture on my face (that's where my esthetician and I disagree). I think the fine lines are so much more less noticeable when I use the moisturizer. Yes, I definitely notice a difference when I don't use lotion or moisturizer. My skin looks older, and very dull. I'd be lost without it! I'll remember to ask my esthetician her opinion. I have to agree with you that moisturizing is very important. And I enjoyed this post!! Good, I'm happy you liked it! You are so right about moisturizing! Hydration is the key to supple looking skin--I couldn't agree more. Moisturizing is so important, I couldn't agree more. I've become so serious about it now that I'm in my late twenties but it's all about prevention. definitely might need to try this now, I really don't use any moisturizer! !